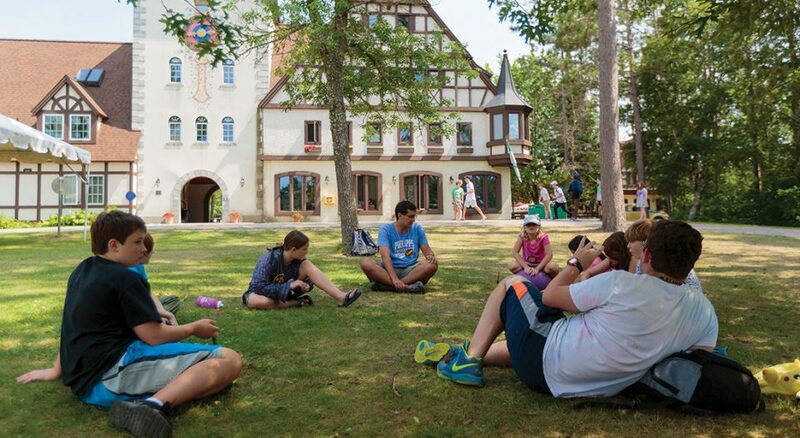 Teachers and “villagers” gather for an informal German language session at Waldsee, the German language village of Concordia Language Villages. One of the gifts of the Information Age is that news and stories from around the world are immediately accessible to almost anyone. But the challenge is what to do when that information raises concerns, especially about places and people many hold dear. Concordia Language Villages, a camp established in 1961 by Concordia College, Moorhead, Minn., to provide cultural immersion programs, experienced this challenge last year. A parent found a concerning link to the German language village’s name, Waldsee, which loosely means a forest, lake or idyllic place in the woods. Alex Treitler’s daughters had attended the Swedish camp, but out of curiosity he googled the terms “Waldsee” and “Nazi” when a family friend attended the German village. He discovered that during the Holocaust, Nazis led Jewish prisoners onto freight trains, promising them they were headed to an idyllic place named Waldsee. Later, arrivals to Auschwitz were told to send letters to family and friends with the Waldsee postmark shortly before they were put to death. Some of the letters that survived reveal horrifying clues of what really happened to the writers. The German village team includes prominent German scholars and historians, including Dan Hamilton, a dean of Waldsee, the executive director of the Center for Transatlantic Relations at Johns Hopkins University and a veteran of the U.S. State Department, including as senior policy adviser to the U.S. ambassador to Germany. Schulze forwarded Treitler’s concerns to Hamilton and other village leaders. In light of the discovery, Hamilton formed an advisory group of historians, Jewish community leaders, educators and parents, including Treitler. He also contacted the mayors of two German towns named Waldsee to ask them to dig into their historical records. Neither was aware of the Auschwitz connection to their town’s name. Concordia Language Villages then addressed the situation head-on, holding open forums for all campers to hear about the Auschwitz connection to Waldsee and join conversations about the name. After all, Waldsee was more than the name of the German village: it was an important part of the founding of the camp and a microcosm of the Northern Minnesota woodsy setting where the villages are located. “All our other village names are a derivation on that theme,” Schulze said. “Waldsee was the first village, and they all resonated back to that as a template. It had such an identification with our entire community.” For example, the Japanese village name translates to of the forest, and the Arabic village name translates to an oasis, as forests are rare in most Arabic-speaking countries. Hamilton said the advisory group learned a lot, not just about the Holocaust or Waldsee but about each other. Some members reminded each other that the Holocaust was not just a German issue, and that it is important to think about how hatred and historical trauma affect all the language villages and how they teach about those issues. Jewish advisory members said it was important to teach about the German Jewish culture beyond the Holocaust, and that the richness of that history should not be neglected to focus only on the horror. Concordia Language Villages’ mission, “to inspire courageous global citizens,” aligns with the camp’s decision to tell the stories of the past, even ones that are potentially embarrassing or painful. Hamilton sees it as part of his Christian faith to build stewards—people who will serve the community and listen to others. Angela Denker is a former sportswriter turned Lutheran pastor, writer and speaker based in Minneapolis.